Это издание включает в себя множество новых утилит, многие из них были обновлены и выборе меню были улучшены. Тем не менее, размер значительно снизился, так что он может поместиться на 2 Gb USB карты памяти Flash. Hiren Boot CD является обширной коллекцией загрузочных и портативных утилит для управления, диагностики и ремонта компьютерных проблем, восстанавления потерянных или удаленных файлов или взлому пароля. Кроме того, Hiren Boot CD предоставляет средства взятия на себя управление любым компьютером и общения с другими компьютерами, интернетом, писать документы или программы, не загружая операционную систему. Boot the CD, select "Dos Programs" and then "Norton Ghost". and there is not enough memory to boot Mini Windows XP). from the HBCD Program Launcher menu. select Ghost from the HBCD Program Launcher menu. Can be booted from HBCD Dos menu. Can be Booted directly from main menu. Run from Mini XP or Mini windows 7. Run from installed Windows XP/Vista/7. This Restored DVD includes all the utilities found in the latest Hiren's Boot CD 15.1 (December 2011). Many utilities have been updated because it is 6 months since the last HBCD release. It is called Restored because it contains all the commercial utilities omitted from the official releases (since version 11.0. )It also includes other tools such by Acronis, Paragon, Active, and other useful software fully integrated within Hiren's menus. In addition it now includes the option to add tools such as Backtrack or Geek Squad's MRI (Detailed instructions included). Below are listed only the additional programmes and utilities found in this DVD. The numbers in square brackets  are referring to the URLs listed at the bottom of this file. 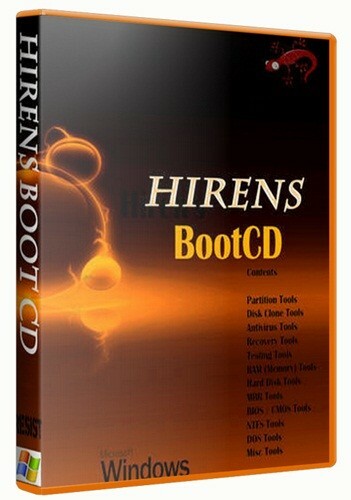 For the complete list of utilities in the official Hiren's Boot CD, read the files HBCD.txt and changes.txt, or visit . These are found within the HBCD DOS menu. These utilities were included in the official but were left out since HBCD version 11. For the following packages there are menu entries,but you need to download and include the iso images yourself. Detailed instructions are included as to how to do this. Read document 'add-optional-utils.pdf'. syslinux, telnet, ssh, vim, mc, etc., and most important: PXE network booting. testing. It includes many well known security (or hacking) tools, e.g. leaves no trace on the computer it uses. For keyboards other than English you can still apply Hiren's keyboard patch. For installation to USB read document 'usb-installation.pdf'. from time to time. A command for this is provided in the Program Launcher. Mini Windows 7 is somewhat slow to start up because it loads some drivers. as Mini XP so do not be confused. else you can boot Mini Windows from DVD and use them from there.